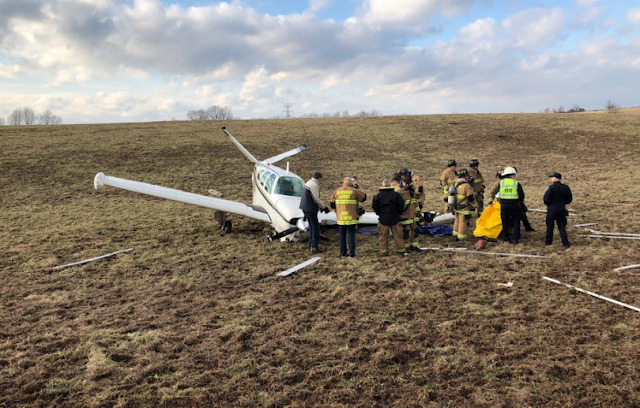 On January 26, 2019, about 1540 eastern standard time, a Beech S35, N6136V, was substantially damaged during a forced landing on final approach to runway 22 at Blue Grass Airport (LEX), Lexington, Kentucky. The airline transport pilot and his passenger were not injured. Visual meteorological conditions prevailed, and a visual flight rules flight plan was filed for the flight which departed Lehigh Valley International Airport (ABE), Allentown, Pennsylvania about 1216. The personal flight was conducted under the provisions of Title 14 Code of Federal Regulations Part 91. In a written statement and conversations with a Federal Aviation Administration (FAA) inspector, the pilot stated that air traffic control vectored the airplane for landing on runway 22 (972 ft elevation), and that his airplane was sequenced behind an airplane landing to the same runway. Preliminary radar information depicted the airplane at 2,300 feet msl when it turned and aligned with the runway 6.3 miles from its approach end. The airplane's final radar target was depicted at 2,100 feet and 3.8 miles from the approach end of the runway. According to the pilot, the airplane was "high" on the approach and he "slipped" the airplane and descended to his desired approach angle. About 1,000 feet above ground level, the pilot added power to maintain his approach angle, and the engine did not respond. The pilot stated the remedial actions he performed to restore engine power were unsuccessful, and the airplane lacked the altitude necessary to glide to the runway. The pilot selected a horse farm directly beneath the airplane's flight path for the forced landing. During the landing roll, the airplane struck several fences which divided the property and substantially damaged the left wing, fuselage, and empennage. The airplane came to rest upright 1.4 miles prior to the approach end of runway 22. According to FAA airman records, the pilot held airline transport, commercial, and flight instructor certificates with ratings for airplane single-engine land, multiengine land and instrument airplane. The pilot reported 13,562 total hours of flight experience; 881 hours of which were in the accident airplane make and model. The pilot completed an FAA-Approved BasicMed Online Course May 4, 2017. According to FAA airworthiness records, the airplane was manufactured in 1965 and had accrued 6,181 total aircraft hours. It was equipped with a Continental IO-55B, 300-horsepower engine that drove a controllable-pitch propeller. The airplane was equipped with a 40-gallon main fuel tank in each wing, and a 15-gallon auxiliary fuel tank mounted on each wing tip. The airplane's most recent annual inspection was completed May 4, 2018 at 6,136 total aircraft hours. At 1528, weather recorded at LEX included a broken ceiling at 3,000 ft, an overcast ceiling at 3,700 ft, visibility 10 miles, and winds from 220° at 9 knots. The temperature was 1° C, the dew point was -4° C; and the altimeter setting was 30.13 inches of mercury. Examination of the airplane by an FAA inspector revealed control continuity from the cockpit to all flight control surfaces. During the initial exam and the subsequent recovery of the airplane from the accident site, the inspector supervised the defueling of the airplane, which captured 37 gallons of fuel from the main tanks. The auxiliary tip tanks were destroyed by impact and contained no fuel. 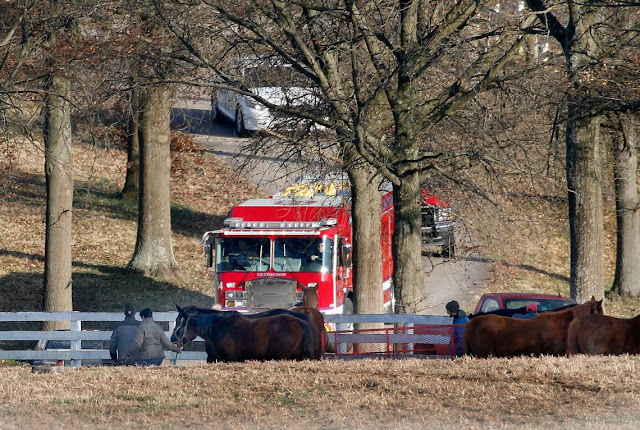 The Lexington Fire Department and police responded to Calumet Farm Saturday afternoon, after a small airplane went down. Two people were on board the plane and appeared to have only minor injuries, the Lexington Police Department said in a Twitter post. The plane had been approaching Blue Grass Airport to land when the incident occurred at 3:45 p.m., said airport marketing coordinator Tiffany Hart. Because the plane was not on airport property, there were no flight interruptions, she said. The two people were taken to a local hospital to be checked, WKYT reported. A Federal Aviation Administration spokesman said Saturday night that the pilot reported engine failure before making a forced landing in a field about a mile from the airport. The plane is a Beechcraft S35 Bonanza. The aircraft is registered to Condor Aviation, of Bethlehem, Pennsylvania, according to FlightAware.com. The website indicates that the plane took off from Allentown, Pennsylvania at 12:16 p.m. Saturday bound for Lexington. The Federal Aviation Administration and National Transportation Safety Board will investigate, with the NTSB leading the investigation, according to the Federal Aviation Administration. LEXINGTON, Kentucky (WKYT) - Lexington firefighters responded to an aircraft down near Blue Grass Airport. Tiffany Hart from Blue Grass Airport confirmed the plane was approaching the airport for landing after 3 p.m. Saturday. Hart said the Beechcraft S35 Bonanza engine failed forcing it to land in a field on Calumet Farm. We do not know where the plane was coming from. There were two people on board. Initial reports from the airport indicated there were minor injuries, however, we are now told no one was injured. Fortunately, the plane was in one piece after the landing though there was a minor fuel leak. WKYT pilot Don Evans said the pilot did everything right under the circumstances to land the plane safely. "In a single-engine aircraft, a lot of your training is centered around whether or not you can make an emergency landing if you have a failure so you're sort of prepared for this," Evans said. "From the moment that you take off, you're ready to lose that engine. It appears that's what happened, in this case, is that pilot was able to make that landing." No flights were interrupted because of the situation.